Anne Toole grew up in Williston, South Carolina. She is a graduate of Anderson Jr. College in Anderson, South Carolina and the University of Georgia with a B.S. Degree in Elementary Education. She taught in a first grade classroom in Augusta, Georgia for 30 years. Ms. Toole has always enjoyed reading and writing poetry. As a child, she loved to listen to nursery rhymes and stories written in rhyme. When she became a teacher, she used nursery rhymes and simple poems in her class to enhance the regular Language Arts curriculum. 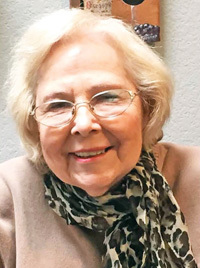 After retiring, Ms. Toole worked part-time for three years as an ESOL teacher and also began writing stories about children and animals. Most of the stories are written in verse. 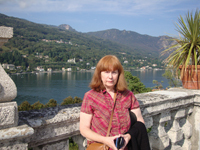 Ms. Toole is an avid traveler and has traveled extensively in the United States, Canada, and Europe. She has also traveled in Northern Africa and the Middle East. She presently resides in Columbia, South Carolina. 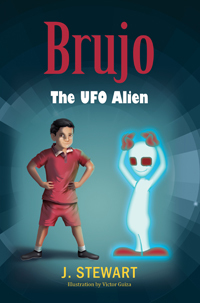 J. Stewart, a life long storyteller sends you the first in a series of Brujo the lovable alien that escaped from the air force hanger to find “with love”. The writer has used himself as a child character named Robert from West Texas. So the stories are from a warm heart bound between the author, Robert and Brujo the alien, a real story with a maybe real alien. A Top Secret Air Force base hanger was on full alert searching for an escaped alien body that had somehow survived the spaceship crash. Men in black and armed military jeeps were lighting the secret area with spot lights to find the unknown dead body that was now alive and running in the dark. Several miles down the hill from the secret base ran a short creature with long white fibers that glowed blue every five seconds. His long arms with red claws interlocked over his head every three steps to glide above the ground for five seconds. Brujo, the name he would be given by a local boy, stopped with a loud yell sounding screath amid glide and pierced his bright red eyes back towards the hanger. He followed with a second high pitch screath carried into the wind towards the base hoping for a returned screath. Brujo listened hoping his co-back Leffler had also survived the spaceship crash and also escaped from the secret hanger. 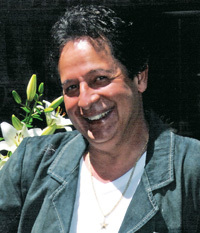 Brujo released a final sad screath into the night wind and quickly ran his one, two, three steps interlocked his clawed hands and glided in a blue haze for five seconds towards town. He floated in a five, three, five rhythm until he reached the first house on the hill from the secret base. Brujo stared at the house high on hill by a ravine and noticed a glass portal on the side of the home. His red eyes scanned through the big picture window and fixed upon a white cloudy figure playing a large grand piano. He yelped a silent screath and thought what kind of creature is this and can it lead me to my earthly invitee known as “with love”? Vonda Jessup is an artist/illustrator. She has designed and created unusual decorative finishes for high-end interior designers and their clients. In addition, she has taught in London, France, Italy, Canada, and throughout the United States. She is writing an ongoing series of children’s stories about Wanda the Witch and Danny the Dragon, who lives in the basement of the Happy Haunted House. 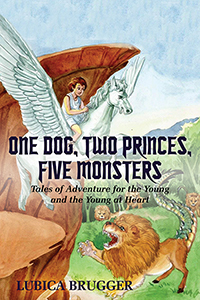 The ghost characters in these stories are named after her grandchildren. 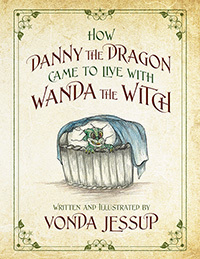 Vonda lives in Phoenix, AZ with her husband Jack and their pig Tea-C.
One evening, Wanda the Witch told the ghosts, who live with her at the Happy Haunted House, the story of how Danny the Dragon came to live with her. One day, Wanda’s dear friend the great wizard Winddorf was gathering mushrooms in a dark cave when he found a very large egg! What happens when he brings the egg back to his castle? This is a heart warming story of how Wanda adopts Danny as her own. It’s a hot day at the farm when Norman the baby bull starts to feel sick from the heat and curls up in the shade of a tree, too weak to stand. His friend Chase notices Norman’s distress and immediately comes to comfort him and cool him down. The next morning, Chase can’t wait to go check on Baby Bull Norman to see if he is feeling better. Children who are taught to show kindness for animals tend to grow up to be kind and concerned about people too. 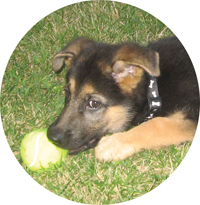 Very often, animals become family to us, and they need to be protected and helped when they are sick, sad, or lonely. 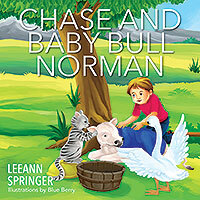 Chase and Baby Bull Norman reinforces this concept in a fun and colorful story that’s sure to delight children and adults alike! 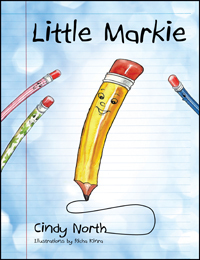 Proceeds from the sale of this book will be donated to the Ronald McDonald House Foundation. About Bradford C. Edwards: I was born on a dairy farm in Cooperstown, New York. Guns were often kept behind the kitchen or closet doors just like a broom or an umbrella. A gun was a tool. Back then, kids knew where the guns were kept. Don’t kid yourself. Today’s kids know were the guns are kept. The question is do they know what to do if a young friend or relative finds and shows them a gun? Today, children are growing up in a high-tech, animated world of make believe. 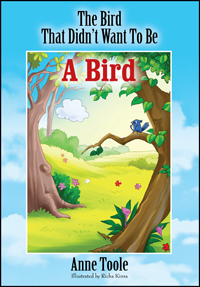 This book reminds kids and parents they must learn the difference between real and fake. Teach kids what to do if a young friend or relative finds and shows them a gun. The book reads in a fun flowing and easy to understand way that could truly save a child’s life. My book is not for or against guns. It is a tool to help stimulate the conversation. It may not be your gun; it may not happen in your home. Tragedy is too often the result when a child finds or shows off a gun. Guns are kept as heirlooms, for hunting and for family protection. Studies show that as many as, one in every three homes on your street may have a gun in it. Be sure your kids know what to do! Teach them it’s okay to tell. 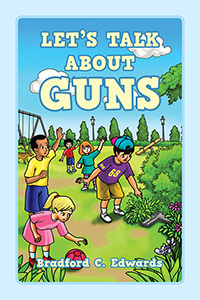 Read “Let’s Talk About Guns” with the kids you love today!